With the update to Version 3, Rittal has completely revised and significantly developed its RiDiag software application for the diagnosis and parameterisation of cooling units. Users such as planners, maintenance personnel or power managers benefit from many new features both when operating cooling units, as well as during long-term data collection. In addition, the new version offers many improvements that make servicing easier and more efficient. The software runs under Windows and can communicate with the cooling units either via a network. RiDiag is suitable for all new Blue-e+ cooling units, as well as for ones with the Comfort Controller. It will soon be possible to parameterise the TopTherm Chiller with RiDiag. The user can see the cooling unit’s most important functions at a glance on the redesigned home screen. The software clearly displays the device name, serial number, current temperature, operating hours, system messages and other parameters. In general, all functions, representations and control options that the control panel makes available to the cooling unit are also present in the software. Any firmware updates can also be loaded directly via RiDiag and installed on the cooling unit’s controller. This calls for a working Internet connection. One special highlight of the new version is support for the user during maintenance and servicing. RiDiag displays all the cooling unit’s status and error messages, and at the same time gives the user comprehensive assistance. If the user moves the mouse over an error message, the software immediately displays a help text explaining how to fix the error. Besides this, the user can make a service request directly to the Rittal Service Department. The software sends the diagnostic data directly to Rittal Service via a Web form. 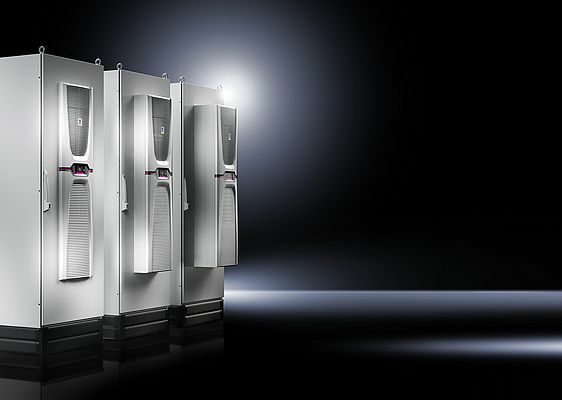 Once the user has specified the location of the cooling unit in the system, this will work worldwide – the software will transmit the request to the appropriate Rittal service branch. Depending on the error, the service technician can bring the necessary spare parts straightaway. This makes it far faster to remedy a disturbance. One new feature in Version 3 is the “Efficiency Cockpit”. The user can visualise all the data and evaluate it here. Along with the temperatures, the input voltages and currents to the motors can also be displayed. Represen-tation of the EER (Energy Efficiency Ratio) is particularly important for energy-efficient operation. Here, the user can recognise which energy efficiency the cooling unit operates at, in which environmental conditions and with which settings. The measured values from all the sensors in the cooling unit are displayed in the cockpit. A depiction of the circuit diagram is also included, as well as the detailed refrigera-tion control diagram. In event of an error, the software directly displays the component that is defective. This saves time during service work and increases availability.